The latest news about the monsters inspired by Kong and popularized by Godzilla, Gamera, and Mothra. Earlier today we were treated to the unveiling of the first Godzilla 2014 official teaser trailer. While there was plenty of visuals to get fanboys/fangirls excited, it seems to have also appealed to the mass media as well. Our first impressions? We love how the scale of Godzilla is emphasized. Another aspect we liked was the real urgency, terror and realness of a city invaded by a giant kaiju. We gathered all the other comments from all over the web, as well as links if you want to read the whole reviews. But first we have the Godzilla 2014 official teaser trailer video below. "How gorgeous is that thing? The cinematography looks incredible, the weight they give the big guy is perfect and Bryan Cranston is crying so something [expletive] is obviously happening." "It’s a fantastic blend of reveal, and mystery. It shows enough without giving too much away. It’s somber as hell, but the effects look great (in the dark, at least). It sets up the size and scope of the creature. And that yell! We’re on board, 100%." "And while we all know how the story goes, Gareth Edwards' new take is bound to be darker, bigger, and undoubtedly scarier." "The first trailer for Legendary’s 2014 monster movie keeps the gigantic nuclear dinosaur mostly hidden behind veils of smoke, but there’s no doubting he’s got a big footprint. Strathairn air-drops a military unit into a destroyed city, and while we get to meet the heroes tasked with fighting the beast, we witness the wreckage he created. The soldiers announce their presence on the way down with red smoke trails. It’s a noble, heroic mission that sadly reminds me of sprinkling fish food into a fish tank. Bon appetit, ‘zilla." "The King of all Monsters himself is little more than a silhouette in the trailer, though evidence of his strength and enormity is seen in flattened city streets and smashed-through skyscrapers." "That bone-chilling, world-shaking "HAAAN!" you hear? That's not a super-sized French Montana, screaming at the Heavens. 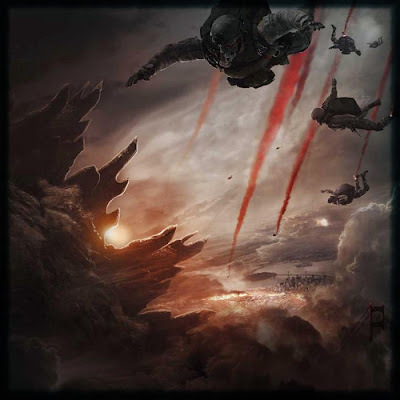 No, that's the signal, plain as day, that the King of All Monsters has returned...The first preview begins by following Aaron Taylor-Johnson, playing a military man, through a HALO jump straight into hell, a city completely devastated by the radioactive monster. The rest focuses on the human element of the story, while teasing images of Godzilla, who appears to be bigger than any previous big-screen iteration." "The new version of the classic monster movie is heavy on the shadows, smoke and military instructions, and light on photos of the actual monster." "...we haven’t seen SF burn like this since Towering Inferno"
"Set to an eerie choral soundtrack, much of the carnage and what's left of a bombed-out metropolis is viewed through the goggles of a soldier (Aaron Taylor-Johnson), who gets the first glimpse of the scaly monster and how truly huge it is. It just gets worse for mankind from there, with moms hugging their kids, subway trains getting ripped apart, holes left in buildings, crumbling blocks falling from the sky, large holes in the earth and what looks like a nuclear option becoming very much a possibility. (This is also where movie fans can get a good look at the rest of the cast, including Bryan Cranston, Juliette Binoche and Ken Watanabe). The trailer ends with the most memorable scene of all, with the camera panning up and showing an intimidating shadow within the smoke, ending with massive jaws and that trademark howl that's been an aural delight for nearly 60 years of monster-movie history." "The mega-lizard appears only at the very end of two-minute teaser." Now you know the opinions state-side, click the following link to get the comments about the new Godzilla trailer from Japan! We love all opinions from kaiju fans, even angry ones, but please keep the language clean. We have younger fans too. Thanks. New Details on the 1983 Godzilla Movie that Never Made It. 8-Bit Pacific Rim. Fire up that Super NES! This site is to celebrate Kaiju as the muse for creativity and imagination. There's something innate withing ourselves that starves for monsters that are bigger than life. Whether these creatures are obvious rubber suits or digital animation, it is the idea that there is something about giant monsters that speaks to our hearts and minds.